Kornerupine is a rare boro-silicate mineral that is especially rare in gem quality. Though kornerupine has reasonably good hardness -- 6 to 7 on the Mohs scale -- and is suitable for jewelry, it is mainly a collector's stone due to its rarity. Kornerupine was first described in 1884 for an occurrence in Greenland and named in honor of the Danish geologist Andreas N. Kornerup (1857-1881). However, gem-quality specimens of kornerupine was not discovered in Greenland until 1975. Since then gem-quality material has been found in a number of locations, including Russia, Madgascar, Tanzania, Kenya, Burma and Sri Lanka. Kornerupine is found in a range of colors, including colorless, rose, greenish, blue, yellow, brown, dark green, olive-green and black. Some kornerupine will display chatoyancy (the cat's eye effect) when cut as cabochons, due to inclusions of rutile or graphite. 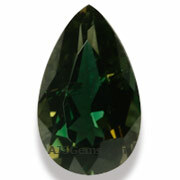 Though all gem-quality kornerupine is rare, the most common colors are dark green and brown. Gemologically, kornerupine is a magnesium aluminum iron boro-silicate hydroxide by chemical composition. It has a density of 3.28 to 3.35 (similar to peridot) and a refractive index of 1.660-1.699 (similar to kunzite). Kornerupine forms in the orthorhombic crystal system and has perfect cleavage in two directions. It has a vitreous luster when polished. Kornerupine is not typically heated or treated in any way. One of the distinguishing characteristics of kornerupine is a strong dichroism, where transparent gems display two different colors when viewed from different angles. The second color is typically green, yellow or reddish-brown, though the bluish-green kornerupine from Madagascar may show a lilac dichroism. Though a few large gem-quality kornerupine specimens have been found, most kornerupine is found in smaller sizes, usually under 2 carats. For such a rare gem, kornerupine is still quite inexpensive.